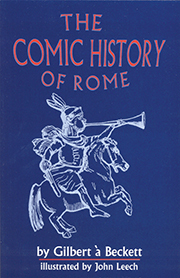 Beckett's The Comic History of Rome, first published in London in 1852, is now available in a reprint. The author's intent is to combine instruction with amusement. Teachers and students alike will welcome Beckett's humor and witty representation of the great chapters of Roman history from the earliest times to the death of Caesar. This work has been prompted by a very serious desire to instruct those who, though willing to acquire information, seek in doing so as much amusement as possible . . . The writer of this book is animated by an earnest wish to aid, as far as he is able, in the project of combining instruction and amusement. Trying to combine instruction with amusement, the author of this curious book presents the events in the history of ancient Rome until the death of Caesar in a humorous way, with woodcuts that often look like comic caricatures. After a humorous narration of the foundation and the royal period of Rome, the author goes on through the multiple episodes and wars of the Republic. After a century and a half, the book has not lost anything of its amusing character and it remains as before an entertaining approach to Roman history.